In November 2016 a sorrowful Brian Molefe announced he would resign from Eskom “in the interests of good corporate governance” after the Public Protector proved just how chummy he was with Gupta Inc. Three months later Molefe received a controversial R30-million golden handshake… err, performance bonus. No, make that a pension fund payout. Because Molefe – Eskom’s CEO at the time – got retrenched. Or resigned. Took early retirement? No, was on unpaid leave. Yeah, we all got lost in the absurdity that stopped short of maternity leave. Thanks to a series of emails and documents leaked from the heart of Eskom, SCORPIO now clears the confusion. By PAULI VAN WYK. Brian Molefe’s resignation “in the interests of good corporate governance” on 11 November, 2016, was a lie. Newly leaked emails indicate that Molefe started planning the feathering of his retirement nest at least as early as a year before, in November 2015 – two months after he was employed by Eskom on a fixed five-year contract. Eskom further defrauded the public when they made a 63-year-old out of the 49-year-old – the evidence will show that Molefe was employed for 15 months at Eskom, but his pension cost was calculated as if he had worked there for 156 months (until the age of 63) and had a 10-year historical service record as an Eskom employee. This despite the fact that Eskom appointed Molefe on a five-year fixed contract, equalling 60 months of employment. Also, remember the confusion over Eskom’s CEO being “retrenched”? Being “retrenched” gave Molefe immediate access to a third of his pension fund, two sources with knowledge of the Eskom Pension Fund rules pointed out. The two pension fund experts Scorpio consulted said no other retirement or resignation option would have granted Molefe the same immediate access to his money. But Eskom’s and its pension fund managers’ biggest conundrum – something they hadn’t realised until Scorpio brought it to their attention, we’re told – is that Molefe was never eligible to be a member of the Eskom Provident and Pension Fund to start with. The severely cash-strapped power utility further paid Molefe a “performance bonus” of R97,537.44 and afforded him an annual raise, backdated from April 2015 – all of this days after Madonsela published her damning State of Capture report. 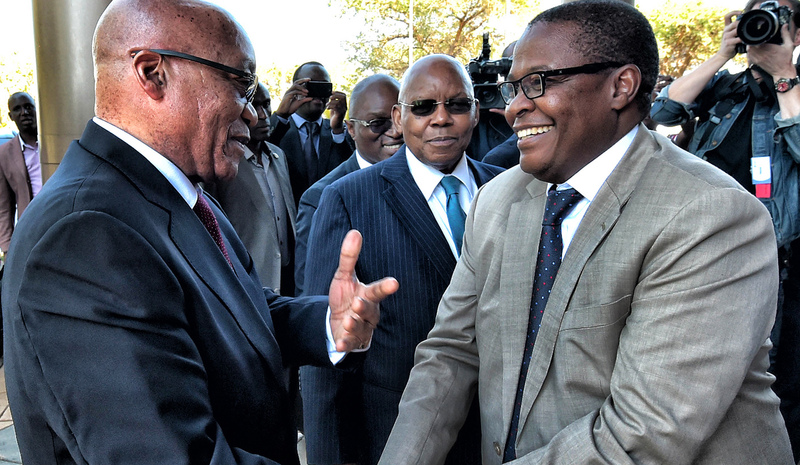 During a 49-minute telephone conversation with Scorpio on Thursday, 13 July, Molefe denied deliberate wrongdoing and fraud, saying he made a “mistake” only in thinking he could take early retirement at 50. He pointed out that Eskom and the Pension Fund “also made a mistake”, aiding him in his error. Eskom, the Pension Fund and Minister of Public Enterprises Lynne Brown declined to comment on Scorpio’s extensive questions, saying the matter is “sub judice” and part of court proceedings. Molefe and Ngubane also declined to answer certain questions. The story of Molefe’s pension fund woes is an example of how wrongdoing, at best, and possible criminality, at worst, spirals out of control when aided by lax controls and ill-equipped, incompetent officials. Scorpio consulted with two attorneys, both specialists in government pension fund matters. They reviewed the documents leaked to Scorpio and assisted in evaluating our findings. They can’t be named because the first is employed by the government and the second oversees government pension funds. Both highlighted “serious red flags” that should have alerted the Eskom Pension Fund to possible wrongdoing. The safety net failed spectacularly. The evidence will show that Molefe, aided by then Eskom board chair Dr Ben Ngubane, Eskom executive support manager Anton Minnaar and senior Eskom officials, were extremely economical with the truth, repeated the lies in affidavits to court, under oath, and that all systems in the Eskom Pension Fund failed when they were needed most. It is further worth noting that former minister of finance Pravin Gordhan was hounded by the Hawks and charged by the National Prosecuting Authority (NPA) in a case widely regarded by constitutional and pension fund experts as extremely spurious. Gordhan was charged for allowing the early retirement of former deputy commissioner of the SA Revenue Service Ivan Pillay in 2010. Pillay was 56 at the time of his early retirement, he was a legitimate member of the Government Employees Pension Fund and the amount in dispute was R1.1-million. Less than a month after Gordhan and Pillay were charged, the NPA withdrew the charges. A weeping Molefe told South Africa during a press conference on 3 November, 2016, that he’s not guilty of all the ills former Public Protector Thuli Madonsela accused him of in her damning report, State of Capture. On the same occasion a defiant Ngubane points fingers to Madonsela, saying “if Brian Molefe resigns she will have to take the blame”. On this day Molefe also gave birth to the mythical Saxonwold shebeen to explain why he frequented the area. Madonsela’s observations included that Molefe phoned Ajay Gupta 44 times, visited the Saxonwold area 19 times and was in regular contact with Atul, Rajesh (Tony) and other Gupta employees. All this around the time of the Glencore/Optimum debacle. On 11 November, Molefe resigns formally, because he’s “doing the right thing” and has “in the interests of good corporate governance” decided to leave Eskom. Molefe’s nobility was, however, a mirage, emails and documents show. In August, about three months before Molefe told South Africa he is resigning “because it’s the right thing to do”, he instructed Eskom’s Anton Minnaar, in charge of the executive’s HR issues, to calculate his pension benefits, sources said. The sources’ information is bolstered by subsequent emails sent by Minnaar to the Pension Fund’s client liaison manager, Solly Ntsibande. The first email was sent on 18 August, 2016, and marked as “strictly confidential” with a “high” importance. Minnaar instructed the Pension Fund to calculate Molefe’s pension fund costs as if he would take early retirement at the age of 50 on 31 December, 2016. The calculations should however be done as if Molefe were 63 years old and all penalties must be waived, Minnaar said. Minnaar himself is 54 at the moment and, according to his LinkedIn profile, has been employed by Eskom since 1990. Minnaar did not react to whatsapp messages nor formal emailed questions asking him to explain his curious interpretation of the rules. Despite the Pension Fund’s own rules, and despite the fact that emails from a year before show the Pension Fund advised that the earliest age for retirement is only at 55, Ntsibande complied with Minnaar’s instruction without alerting Minnaar or Eskom to the correct facts. It’s noteworthy that Minnaar was prodded into action only a few days after Molefe received Madonsela’s email requesting information for her investigation into State Capture. Another formal document detailing Molefe’s date of resignation and pension fund costs is drafted in October 2016 when the Pension Fund provides Molefe with a “Benefit Statement”. At the back of the document the earliest retirement age is, again, noted as 55. Responding to Scorpio’s questions relating to when he first indicated to Eskom that he would want to retire, Molefe explained how much the PP’s report pained him and that he resigned for that reason. When prodded further, Molefe continued, saying “it may look suspicious to you, but I admit that I made enquiries before November, it was purely out of curiosity, it does not mean I had made a decision at that point”. Molefe’s comments do not add up. On all relevant documents, the early retirement date of 31 December 2016 was already noted and factored into the calculations at least three months before he formally resigned. Ngubane also admitted to have known about “talks that Molefe wanted to retire” only after Scorpio confronted him, too, with the facts. In May this year Minister of Public Enterprises Lynne Brown rescinded Molefe’s “early retirement” and the Eskom board opted for Molefe to return to work. His absence from January to mid-May was changed to “unpaid leave”. “We made an honest mistake,” Molefe said. In subsequent court papers filed in two cases where the DA and EFF challenged Molefe’s return to Eskom, Molefe and Ngubane described in their individual affidavits that Molefe’s resignation decision was made only after Madonsela’s state capture report was published. When it was pointed out to Molefe and Ngubane that their affidavits contradict the facts laid out in several documents and emails, both denied lying. Two days after Madonsela published her damning State of Capture report (on 2 November, 2016) and a day after he started crying in public, Molefe was awarded an annual remuneration raise – retrospective from 1 April, 2016. And so Molefe’s pension fund received a further boost. Both Ngubane and Molefe claimed that Eskom concluded “about two” performance reviews and was “very happy” with how Molefe “turned Eskom around”. “You’ll note there was no load shedding this month,” Molefe jubilantly added when questioned by Scorpio on 13 July this year. Ngubane also denied that there was any conclusive reason for Molefe not to receive the remuneration hike because Madonsela’s report is “unsubstantiated”. So happy was Eskom with Molefe that a performance bonus of R97,537.44 was paid to him in the same month, documents show. Molefe said he “can’t remember getting the bonus or the raise”. Molefe also couldn’t remember that he already asked about his retirement in November 2015 – only two months after being permanently employed. In a series of about seven emails sent between November 2015 and 21 December 2015, Minnaar asked the Pension Fund to do various calculations taking different factors into account. This included a year-on-year raise of 6.5%. It is not clear if this set of factors was included in the final calculations, but the Pension Fund replied at all times that the earliest retirement age was 55. This comes on the back of reports that Eskom is currently “sitting on its last R20-billion”. The Sunday Times claimed on Sunday to have had sight of Eskom’s controversial annual financial statements. Publishing of the financial statements has been delayed amid red flags identified by the power utility’s auditors. Molefe’s pension fund woes are said to be one of these red flags. The Sunday Times reported that, despite Eskom being cash-strapped, Molefe is to be paid a R2.1-million bonus. It is unsure if the R97,537.44 already paid in November last year is part of this newly reported bonus. Eskom is allegedly so short of funds that it might not be able to pay its salaries in November. Twenty days after Ngubane signed off on Molefe’s annual salary hike, on 24 November 2016, he also approved Molefe’s “early retirement”. “Your early retirement has been approved in terms of Provident Fund Rule 28 and 21.4, which means that penalties will be waivered (sic) and that potential service to age 63 is granted,” Ngubane wrote. In the Pension Fund rule book Rule 28 is the section headed as “Retrenchment”. There is no description other than rules relating to the retrenchment of an Eskom official under Rule 28. Retrenchment means the position of the incumbent is redundant, the consulted pension fund experts said. A lump sum of R9,767,743.68 (before tax and deductions) was subsequently paid to Molefe in February 2017, along with the first monthly pension payment at R111 866.17 (before tax and deductions). In court documents Ngubane later bizarrely described the use of Rule 28 as a “common mistake” made by Eskom and the Pension Fund. The Pension Fund’s rules state the earliest retirement age is in fact 55 years. A board resolution cannot trump the fund’s rules. Based on this factual error, the Eskom board further resolved to “bridge the gap to make up for the 10 years” Molefe did not have under his belt. The resolution was specifically written for cases where “executive directors on fixed-term contracts” decide to take early retirement and there is a shortfall in the Pension Fund’s rule that such a director must have at least 10 years’ service. The board also resolved to refund the Pension Fund for the actual costs for “additional service added” – therefore covering the shortfall between Molefe’s contribution and what the fund would pay out in the end. The result was that Molefe only worked for 15 months at Eskom until he was 50 years old, but received a pension fund benefit calculated on 156 months, as if he were 63 years old and had a 10-year service history. These skewed factors were used to ramp up Molefe’s pension fund to R30.1-million. Board minutes on the same date as the February 9, 2016 board resolution allude to the possibility that minister Brown did not agree to the resolution and that it was signed and implemented without her consent. During a seven-minute telephonic conversation with Scorpio on 14 July, Ngubane lifted the veil of secrecy on why Eskom settled on a deal that would cost it millions. “Molefe was concerned about the amount his pension fund would pay out after leaving Eskom. I remember having discussions where he was concerned about having been moved around during his career to fix ailing institutions that didn’t allow him to accrue a big pension,” Ngubane said. Minnaar related the same concerns to the Eskom board, the February 9, 2016 minutes show, and in court documents Brown alluded to the same. When questioned on how he could sign off on a fatally flawed resolution, Ngubane claimed not to have known what Rule 28 entails, saying Scorpio is “losing sight of the fact that I was always advised by Eskom’s board and senior management, I only signed these things. Some of them actually felt quite strongly about Molefe’s pension fund”. Molefe in turn said he was “not retrenched”, until Scorpio confronted him with the fact that he took early retirement under the Pension Fund’s retrenchment rule. “I didn’t know what the rules said and I didn’t ask for retrenchment. I asked for early retirement,” Molefe replied. Molefe’s pension fund debacle should never have happened if the Pension Fund knew and abided by their own rules, one of Scorpio’s sources advised. As already mentioned, Molefe was appointed on a fixed-term contract of five years. In terms of the Pension Fund rules Molefe was therefore a “temporary employee”. Molefe was not eligible to be a member of the Pension Fund. Neither Molefe nor Eskom should have been allowed to contribute to Molefe’s pension fund. The only way to recoup the money is for a competent court to make such an order, one of Scorpio’s sources said. It means Eskom will have to spend more money on legal fees to get back what should not have been paid in the first place. Molefe has also been instructed by the Eskom board to pay back the money, including interest of more than R400,000.